I am most definitely showing off when I announce to you that this year I received an invitation from the High Commissioner of India to attend the India Independence Day celebrations at the embassy in Ottawa. I could not attend, due to competing engagements in Toronto, but I was itching to bone up on my Hindi! Yes, August 15th was the 62nd anniversary of India‘s (and Pakistan’s) date of independence from British rule. It comes this year at an interesting time in history, when all the world sees India now as an economic juggernaut (ironically a Hindi word, co-opted into English) and possibly the next true global superpower. It’s important to remember, though, that India’s power and wealth are in fact historic norms. In the history of the world, the globe’s biggest economies have always been India and China, with the exception both of the past century and of the heydey of ancient Egypt. It’s also important to remember that India’s power and wealth come at a great price: the extreme exploitation of the weak, poor and vulnerable. It’s for this reason that I’ve been predicting for a while now a labour revolution in India, probably within the next 15 years. These are some of the things I hope to talk about at this year’s NetIP conference in Toronto. Plan to attend! 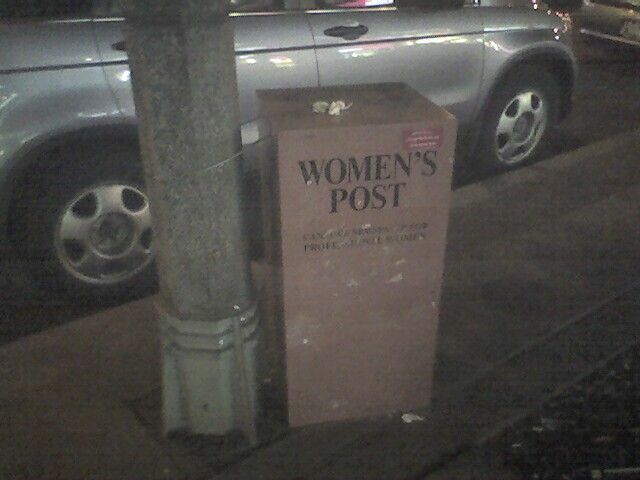 It’s the “women’s post”…. for hitching your woman to while you get a coffee? Yes, yes, you know where to send your hate mail.